Justice League Vol 4 Endless (Rebirth) - купить по выгодной цене | Магазин комиксов "Двадцать восьмой"
The Justice League are dead. Manhattan is destroyed. And, somehow, it’s all Flash’s fault. A mysterious attacker with a mega-powerful weapon keeps targeting the Flash and those around him, blaming Flash for his family’s death. Every time Flash comes into contact with the weapon’s energy, he finds himself flung further back in time. The Flash is joined by Justice League member Batman—now can they solve the mystery and save the city before time catches up to their destruction once more? 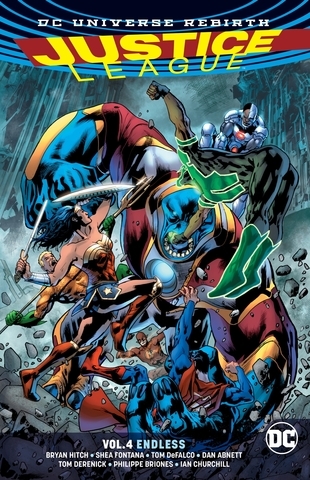 Writer/artist Bryan Hitch (THE AUTHORITY) is joined by guest creators including Shea Fontana (DC SUPER HERO GIRLS), Dan Abnett (AQUAMAN), Ian Churchill (TEEN TITANS), Tom DeFalco (SUPERMAN), Philip Briones (NEW SUICIDE SQAUD) and Tom Derenick (INJUSTICE: GODS AMONG US) as the world’s greatest detectives face challenges they can’t overcome with might alone! Collects issues #20-25.